Rocakway Beach and art go together like a surfer in the water on a clean green day. MoMA PS1 presents Rockaway! 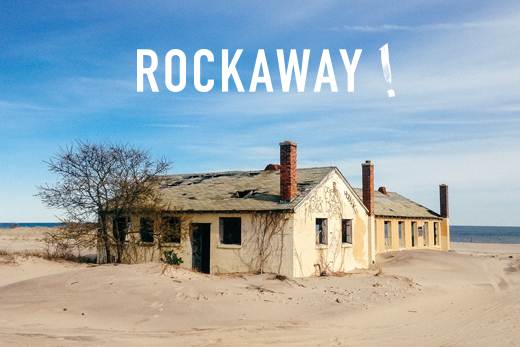 a public art festival, located at Gateway National Recreation Area’s historic Fort Tilden and a group exhibition at the Rockaway Beach Surf Club, on view from June 29–September 1, 2014. Rockaway! includes works by local and international artists, with a major installation and presentation of photographs by Rockaway resident Patti Smith at the Rockaway Artists Alliance gallery, an outdoor sculptural installation by Argentinian artist Adrián Villar Rojas at the former military fortifications along the ocean, and a large-scale sound installation in a 3,000 sq. ft. historic chapel by Canadian artist Janet Cardiff, on loan from The Museum of Modern Art (MoMA). Sponsored by the Jamaica Bay-Rockaway Parks Conservancy, Rockaway!celebrates the reopening of Fort Tilden and the ongoing recovery of the Rockaway peninsula, which suffered significant damage from Hurricane Sandy in 2012. The event is the result of an unprecedented partnership between the National Park Service and New York City Department of Parks and Recreation to restore and revitalize 10,000 acres of parklands surrounding Jamaica Bay, one of the most biologically diverse urban estuaries on the Atlantic Seaboard. The nearby Rockaway Beach Surf Club, a central hub for the local community and base for relief effort operations during Hurricane Sandy, will host a group exhibition of local and international artists alongside event-based programming. The exhibition of surf-themed and Rockaway beach-inspired art is connected to the upcoming Honolulu Biennial in 2016, focused on groundbreaking international contemporary art, in addition to highlighting Hawaii’s notable, but under-recognized contributions by its communities and individuals to global arts and culture on an international stage. Hope you can check it out. Full details here.